Dyacon gives you current, site-specific conditions whenever you need them. 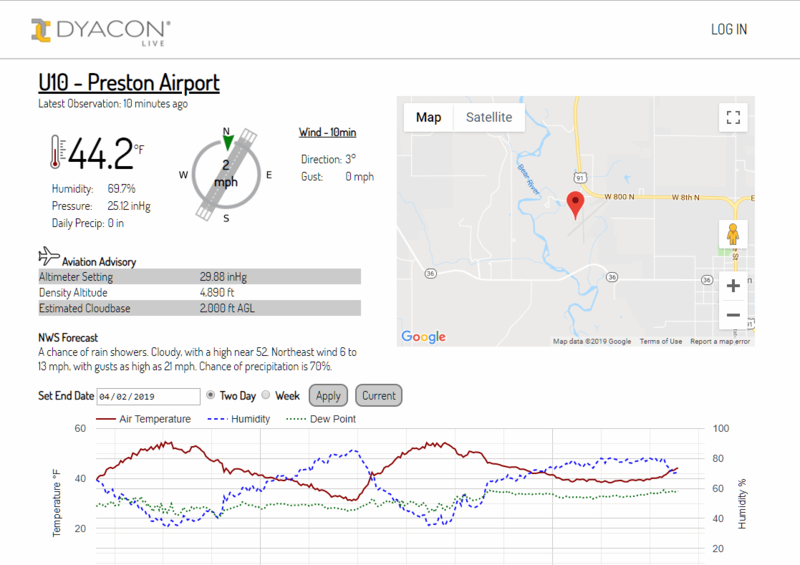 Using DyaconLive (a service included with every weather station equipped with a cell phone), you can view aviation-specific variables such as density altitude. A network-connected webcam can be used to view the runway conditions on DyaconLive as well. Hear it from Dyacon Station users themselves. “For the last 4 years we have been using Eugene’s system with text message access with great success. The equipment is very reliable, provides a timely and accurate transmission of important airport weather. We have had several pilots use the weather data while in-flight to determine if they needed to divert because of unfavorable or high winds from many miles away. 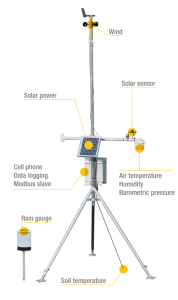 “We at Papillon Airways, Inc. are very happy with the Dyacon weather station. It has delivered exactly what we were looking for. Our temperatures during the summer get so hot that we often have to discontinue our helicopter flights. By having the weather station at our landing site at the bottom of the Grand Canyon, we can see exactly how hot it is and also how fast the temperature is rising. This has greatly improved our ability to anticipate the need to stop operations. We have had fewer interruptions to our operations since installing the weather station. “In blueberries crop, under specific meteorological conditions, it is common B.cinerea sp attack the flowering and also fruit set, affecting economical results at the end of the harvest season. We can estimate Growing Degree Days in combination with Deficit Vapor Pressure to predict fungus development.